With over 30 years of combined experience, Mark Edwards and Antony Deakin have joined forces to become Mark Antony Windows. Our aim is to provide the best service supplying and installing PVC-U and aluminium products in the South East, and all at competitive prices. We cater to all needs with every aspect covered. From complete conservatories, including design, project oversight, planning regulation, etc, to minor repairs, locks and condensated units. Our windows are manufactured using the WHS Halo Profile. Using a unique technology of a five chamber thermal system to give extra protection against the outside elements. They undergo extensive testing to ensure maximum insulation. It is important to be environmentally friendly, therefore all of our frames are calcium organic and are recycled to create a number of PVC products. 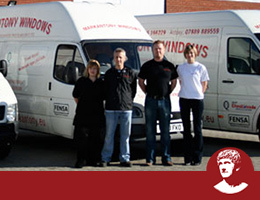 Mark Antony Windows came to the rescue to help a family that had been the victim of Cowboy Builders. In the show that was first aired on 18th August on Channel 5, they replaced the windows and doors at the house in Southwater, West Sussex. For the full story and pictures, click here.